Wei-Wen Yu, PhD, PE, is Curators' Professor Emeritus of Civil Engineering at Missouri University of Science and Technology (formerly, University of MissouriRolla) and Founding Director of Wei-Wen Yu Center for Cold-Formed Steel Structures. He was awarded the 2001 Shortridge Hardesty Award from the ASCE and the 2009 Lynn Beedle Award from the Structural Stability Research Council. Roger A. LaBoube, PhD, PE, is Curators' Distinguished Teaching Professor of Civil Engineering at Missouri University of Science and Technology (formerly, University of MissouriRolla) and Director of Wei-Wen Yu Center for Cold-Formed Steel Structures.?Dr. LaBoube is an active member of AISI Committee on Specification and Committee on Framing Standards, and has an extensive industry and academic background related to the design and behavior of cold-formed steel structures. 1.2 Types of Cold-Formed Steel Sections and Their Applications. 1.3 Standardized Metal Buildings and Industrialized Housing. 1.5 Research and Design Specifications. 1.6 General Design Considerations of Cold-Formed Steel Construction. 1.7 Economic Design and Optimum Properties. CHAPTER 2 MATERIALS USED IN COLD-FORMED STEEL CONSTRUCTION. 2.2 Yield Stress, Tensile Strength, and Stress–Strain Curve. 2.3 Modulus of Elasticity, Tangent Modulus, and Shear Modulus. 2.6 Fatigue Strength and Toughness. 2.7 Influence of Cold Work on Mechanical Properties of Steel. 2.8 Utilization of Cold Work of Forming. 2.9 Effect of Temperature on Mechanical Properties of Steel. 2.10 Testing of Full Sections and Flat Elements. 2.11 Residual Stresses Due to Cold Forming. 2.12 Effect of Strain Rate on Mechanical Properties. CHAPTER 3 STRENGTH OF THIN ELEMENTS AND DESIGN CRITERIA. 3.5 Structural Behavior of Compression Elements and Design Criteria. 3.6 Perforated Elements and Members. 3.7 Plate Buckling of Structural Shapes. 4.2 Bending Strength and Deflection. 4.3 Design of Beam Webs. 4.4 Bracing Requirements of Beams. 4.5 Torsional Analysis of Beams and Combined Bending and Torsional Loading. 4.6 Additional Information on Beams. 5.4 Torsional Buckling and Flexural–Torsional Buckling. 5.5 Effect of Local Buckling on Column Strength. 5.6 Distortional Buckling Strength of Compression Members. 5.7 Effect of Cold Work on Column Buckling. 5.8 North American Design Formulas for Concentrically Loaded Compression Members. 5.9 Effective Length Factor K.
5.11 Bracing of Axially Loaded Compression Members. 5.13 Compression Members Having One Flange Fastened to Decks or Panels. 5.15 Additional Information on Compression Members. CHAPTER 6 COMBINED AXIAL LOAD AND BENDING. 6.2 Combined Tensile Axial Load and Bending. 6.3 Combined Compressive Axial Load and Bending (Beam–Columns). 6.4 North American Design Criteria. 6.7 Additional Information on Beam–Columns. CHAPTER 7 CLOSED CYLINDRICAL TUBULAR MEMBERS. 7.2 Types of Closed Cylindrical Tubes. 7.5 North American Design Criteria. 8.7 Rupture Failure of Connections. 8.8 I- or Box-Shaped Compression Members Made by Connecting Two C-Sections. 8.9 I-Beams Made by Connecting Two C-Sections. 8.10 Spacing of Connections in Compression Elements. CHAPTER 9 SHEAR DIAPHRAGMS AND ROOF STRUCTURES. 9.3 Structural Members Braced by Diaphragms. 10.3 Sectional Properties and Design of Arc- and Tangent-Type Corrugated Sheets. 10.4 Sectional Properties and Design of Trapezoidal-Type Corrugated Sheets. 11.3 Composite Beams or Girders with Cold-Formed Steel Deck. CHAPTER 12 INTRODUCTION TO STAINLESS STEEL DESIGN. 12.2 Differences between Specifications for Carbon Steels and Stainless Steels. 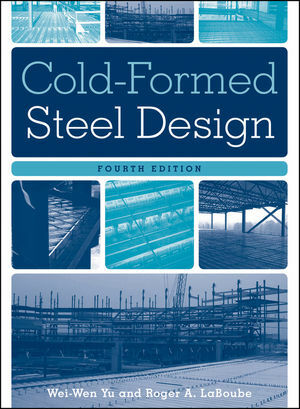 14.2 Computer Programs for Design of Cold-Formed Steel Structures. 15.2 North American DSM Provisions. 15.3 Commentary on Appendix 1 (DSM). 15.4 Direct-Strength Method Design Guide. APPENDIX A THICKNESS OF BASE METAL. B.4 Design Criteria for Combined Bending and Torsional Loading. APPENDIX C FORMULAS FOR COMPUTING CROSS-SECTIONAL PROPERTY βy. APPENDIX D DEFINITIONS OF TERMS.